Saturday morning started bright with patches of blue sky, however rain was expected to move in soon so once again it was time to scour the forecasts desperately in search of some inspiration. The bad weather was approaching everywhere with just a chance of something decent over the Hebrides. 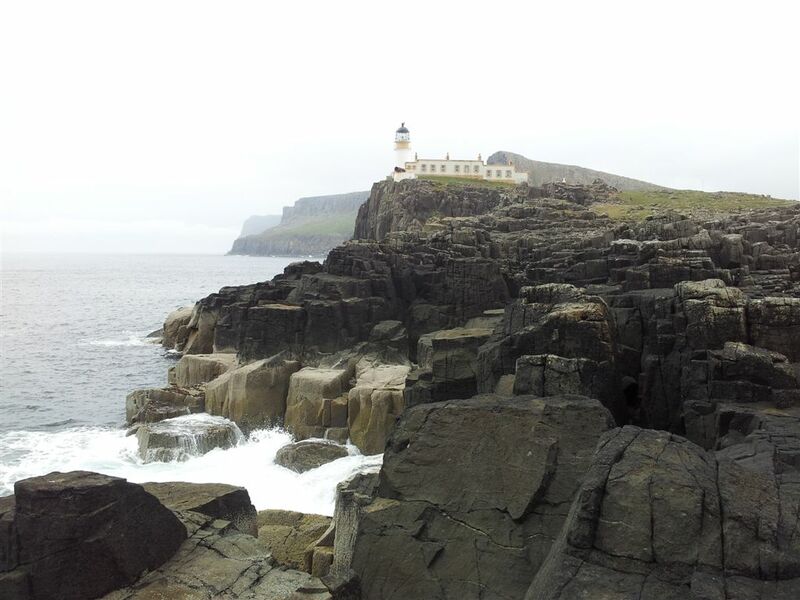 We couldnt go there, but we could certainly go west to Skye, so that’s where we headed. 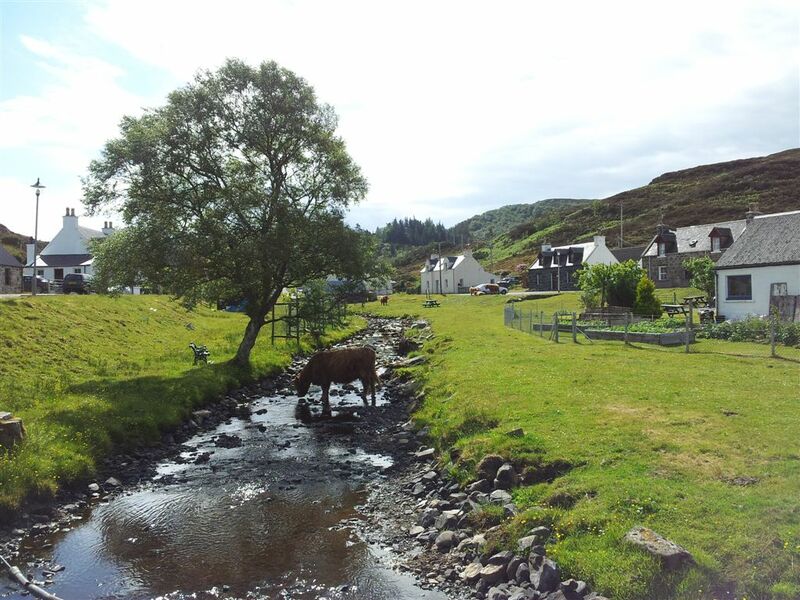 We set off from Plockton with a brief diversion at Duirinish as the Highland Coos were in the village; Duirinsh is a great little place, split by a stream and is very very McQuirky. 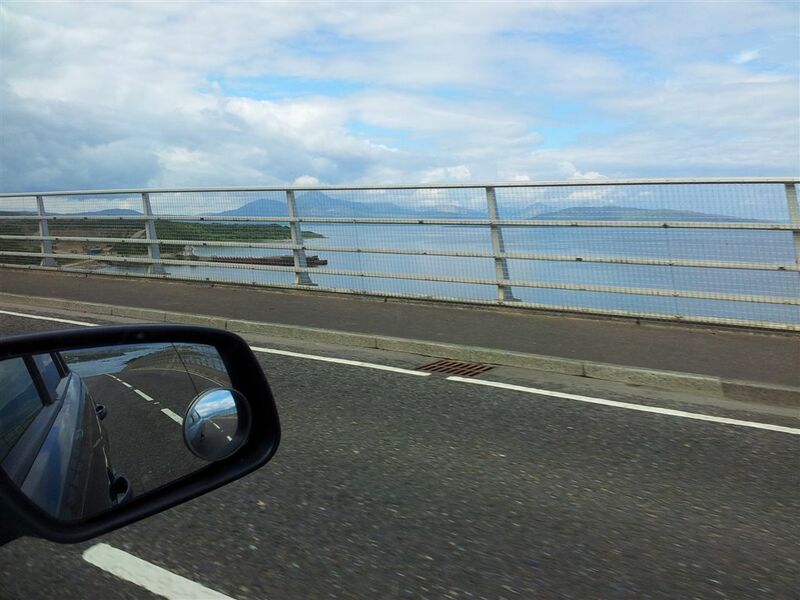 Soon we were driving over the Skye Bridge, always a very happy event especially when there’s a rare patch of blue sky over Skye. 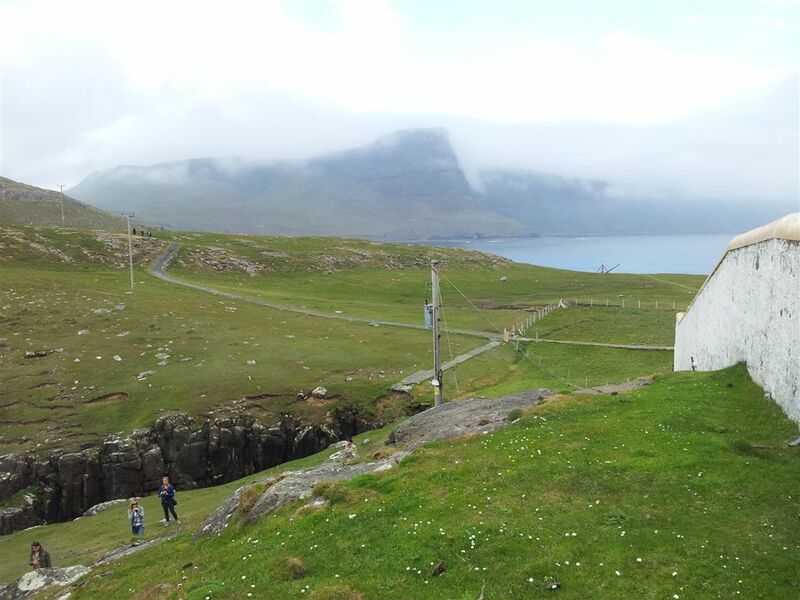 The weather looked good over the sea and lowland areas however the mountain areas were already beginning to deteriorate. 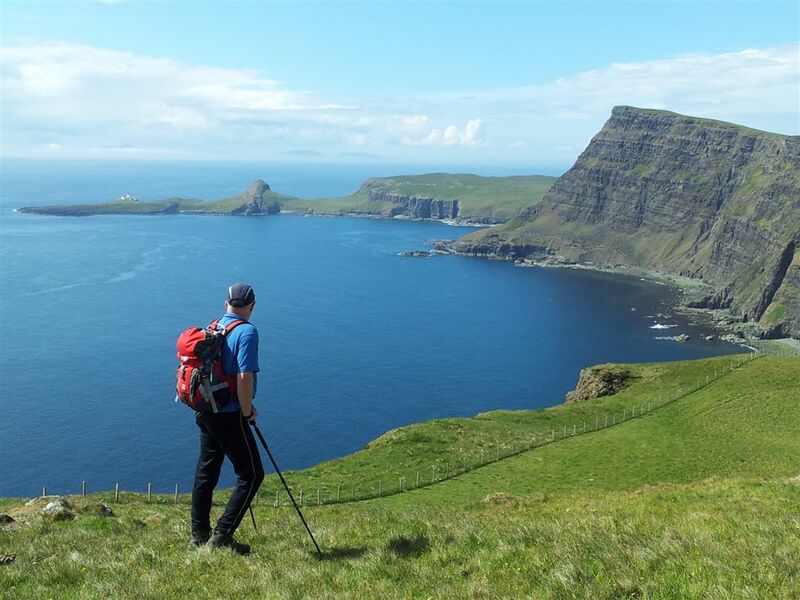 We had a number of options with Sligachan being nominated as the decision making point as we could either walk straight from the car, carry on to Trotternish, or go westwards to the coasts. 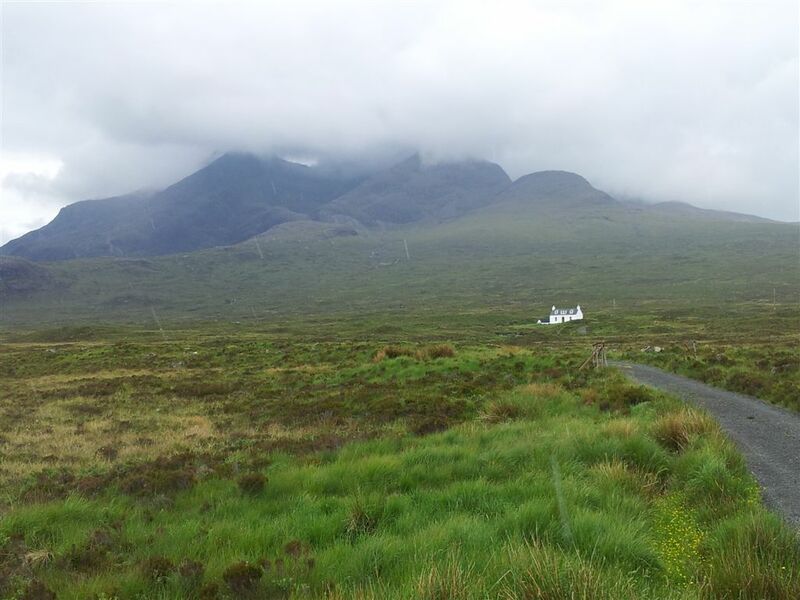 Unfortunately as we parked at the iconic Sligachan layby for the classic Cuillin view, things weren’t too great. Once again the phone camera really flatters the conditions below though the streaks of rain show up quite well. This was also forecasted to get worse. We arent just fairweather walkers but as we only get up to this area once or twice a year the thought of walking around in cloud and rain wasn’t the preferred choice, after all we can do that in the Lakes or Cheviots anytime 🙂 So we convinced ourselves to head west in search of the rumoured clear Hebridean skies. I’d been inspired by that surprisingly good coastal walk the day before on Sandaig, I really fancied the coast again & somewhere new. Once past the Cuillins things slightly improved along the A863, as we approached Dunvegan we were nearly tempted by the greyed out MacLeods Tables but glimpsing a hint of blue sky further ahead decided to drive north west up the B884 and try a simple coastal walk to Waterstein Head. We parked just north of Ramasaig in uninspiring moorland and started walking up to the Head which didn’t take long on easy ground. 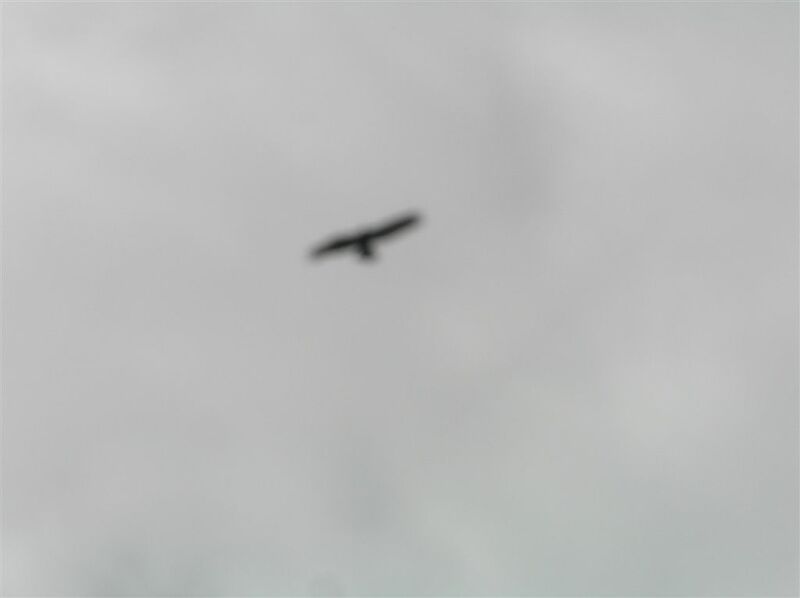 Then I spotted something in the sky, it was big, circling and very definitely an eagle. Rucksacks were hurled on the ground, cameras fumbled for and pointed at the sky. I’ve only ever seen two eagles before and they are really difficult to take pictures of when flying at distance. It landed on the highest fence post and then lifted off soaring straight towards us, I then took two amazing photos, both of which have since won numerous awards, one was even shortlisted for the Countryfile Calendar and was the favourite of John Craven. Wildlife Photography like this is a skill that few possess, it’s all about being in the right place at the right time of course then ensuring your depth of field settings correctly offset the backlighting to accentuate the feather textures and the birds wing colours. Like I said, photographing eagles is not easy, I eventually gave up and just watched this king of birds through the binocs. Soon it was far far away and we continued up to Waterstein Head where there’s a trig point sitting above 1,000ft cliffs plunging down to the sea. 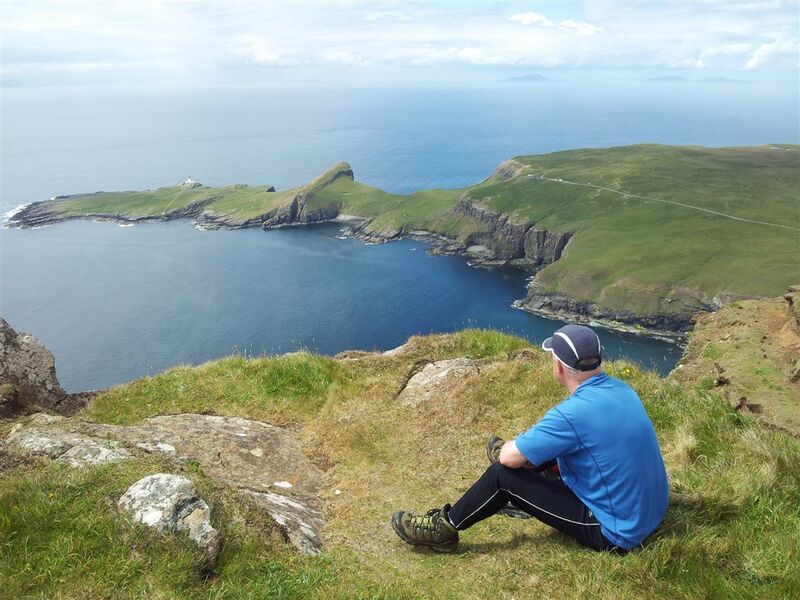 With sunshine now overhead the disappointing eagle pictures were compensated by the views from this spot across Neist Point out to the Outer Hebrides. 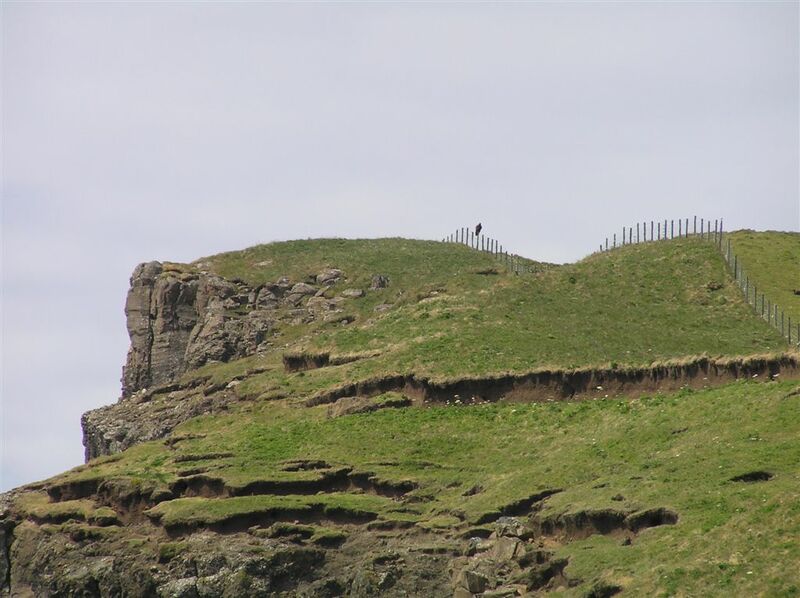 We hoped in vain for the eagle to return, then lost track of time up there gazing at the sea with the binocs, the tiny dots of people on Niest, then crawling to the cliff edge looking straight down. 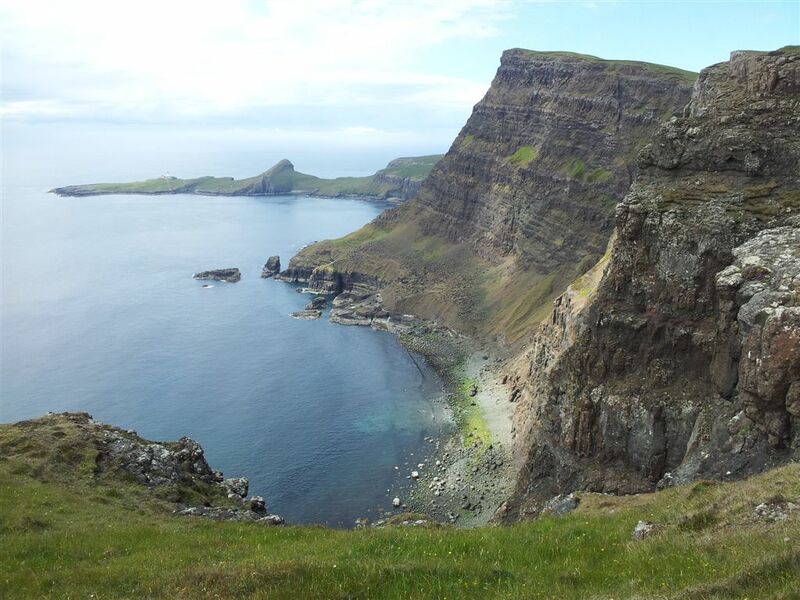 Eventually we moved off for a walk south along the top of the cliffs, there was a line of cloud behind us with sun overhead stretching westwards which accentuated the views & colours. None of the pics are altered, this is just how the afternoon panned out. Looking straight down, keeping a tight grip on the phone! 3.30pm. I had to train for years to pose like this! Niest looked very inviting so rather than continue the walk south to The Hoe we decided to turn back at Ramasaig cliffs then drive over to the Point. On top of Ramasaig we got the binocs out again looking back at the route. The Hebrides unfortunately had been hazed out all afternoon which is a pity as they are very close from here and would have framed the blue sea nicely. 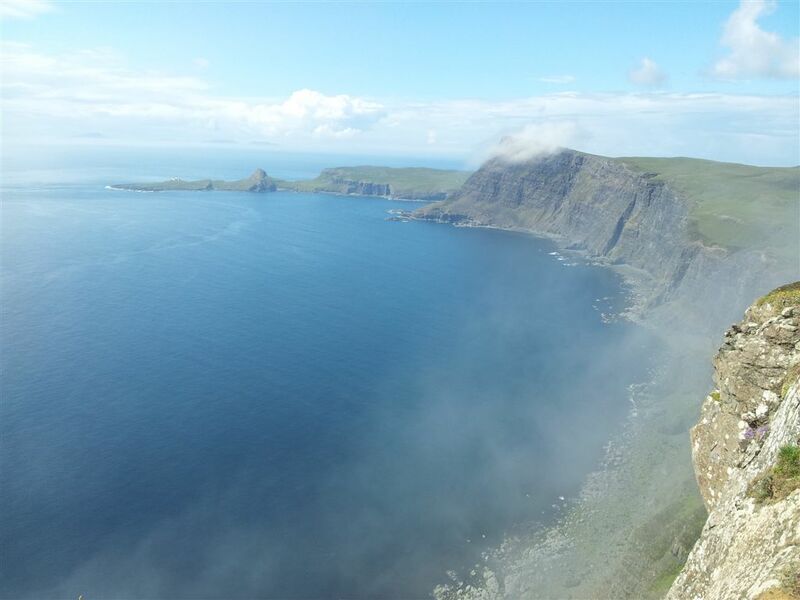 We spotted a tiny white circular cloud of ‘smoke’ suddenly appear on the cliffs below Waterstein rising up then disappearing. This seemed a bit weird, then another one appeared, then I turned round and looked south to see the scene below. This was 20 minutes after the photo above. 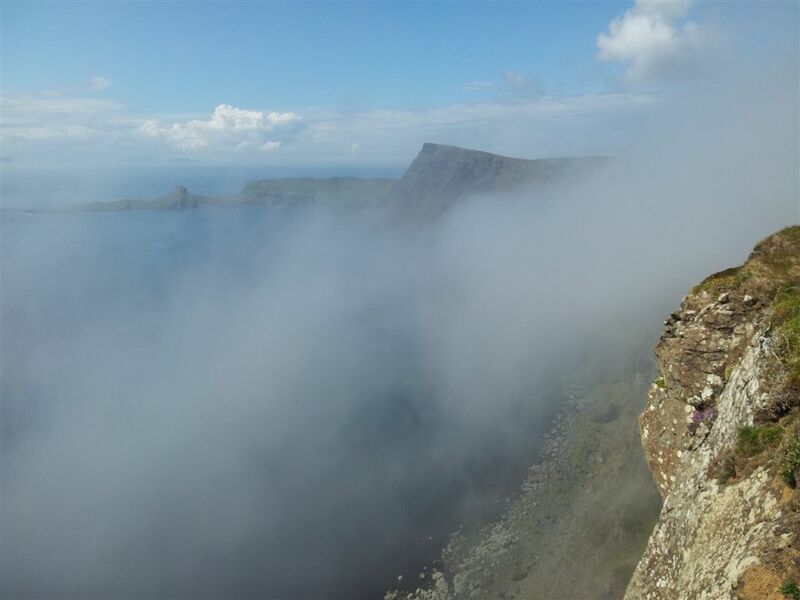 There was no sign of mist anywhere else, it had literally formed below us instantly on the cliffs as we sat there! An amazing weather moment to add to the list of others. 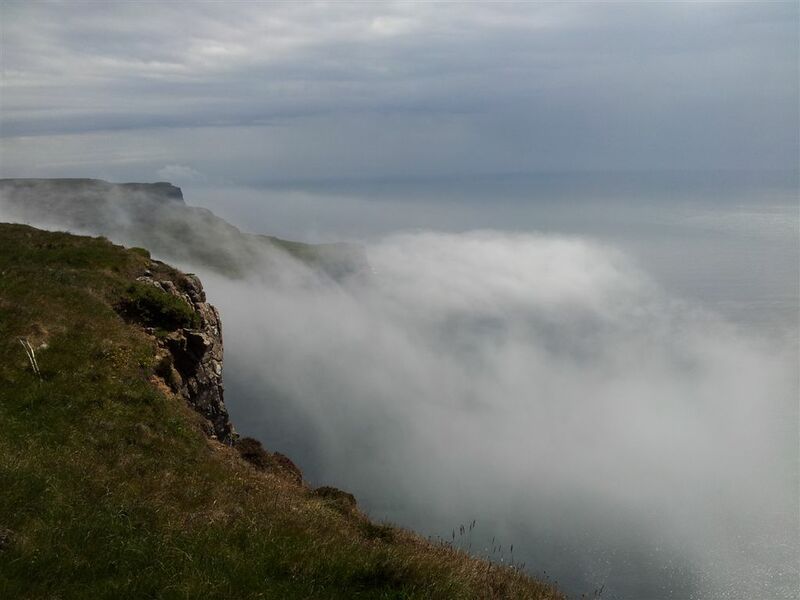 And then it seemed just as instantly the mist had all but gone as we started heading back to the car, then suddenly it came back again and started sweeping over the cliffs around us. Made a dramatic fun end to the walk and when back at the car I’d managed to get sunburnt too, hadn’t even thought about packing suncream in the morning. Details of walking around Waterstein Head are here on Walk Highlands we only did the top half of the walk and were out around 3hours inclding much gazing and sitting. I’d already booked a first visit to the Stein Inn for dinner at 7.30pm so there was still time for more fun, starting from the car park at Niest Point. 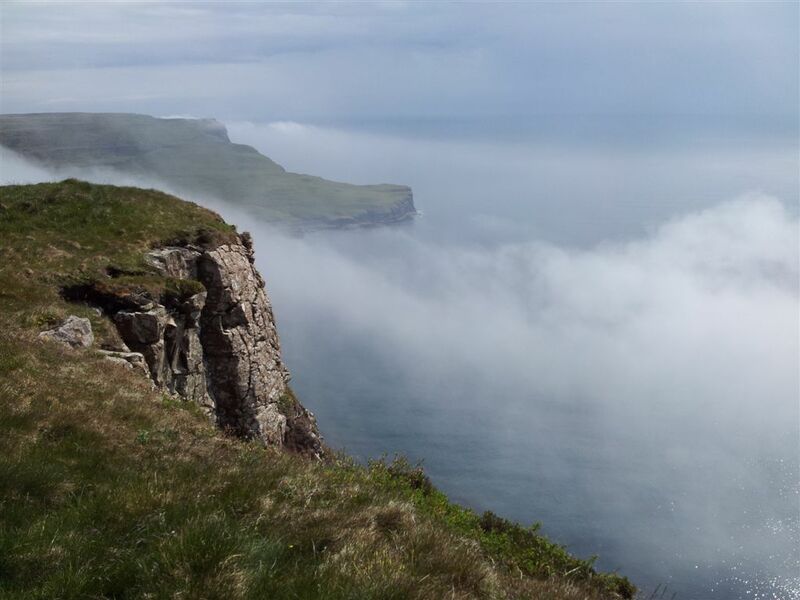 Interesting looking across to Waterstein Head cliffs, now completely enveloped in mist. 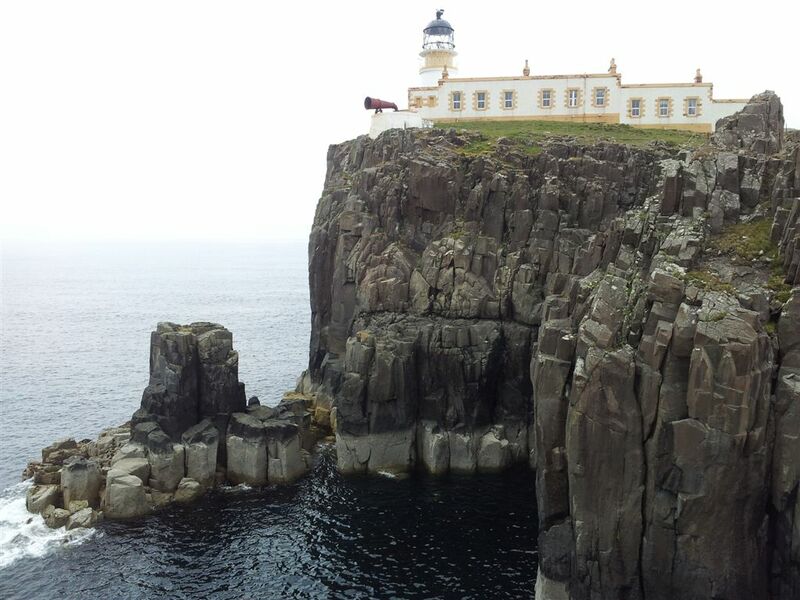 The lighthouse sits on basalt rock with columns all around, apparently there’s a giant fog horn somewhere up there? 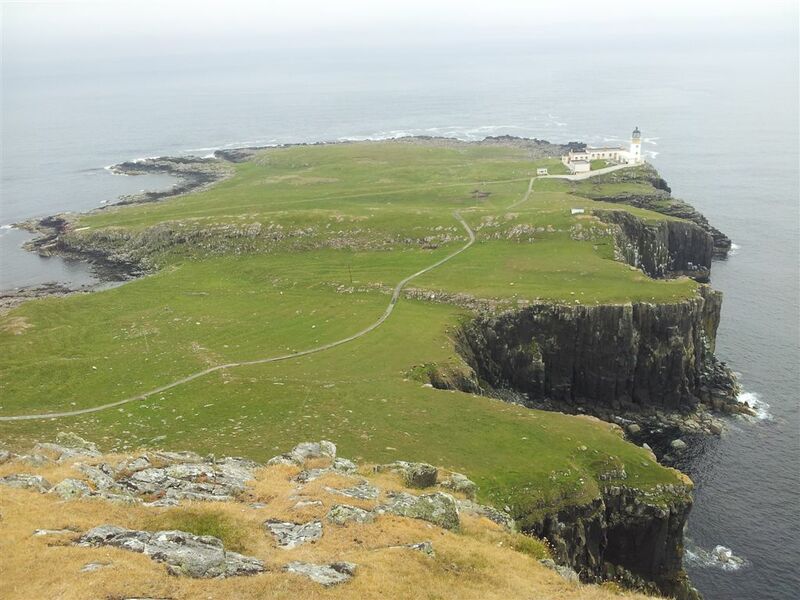 This is the most western point on Skye and a fantastic vantage point for wildlife including whales, not that we saw any. Met a nice Dutch couple, everyone was staring out to sea. 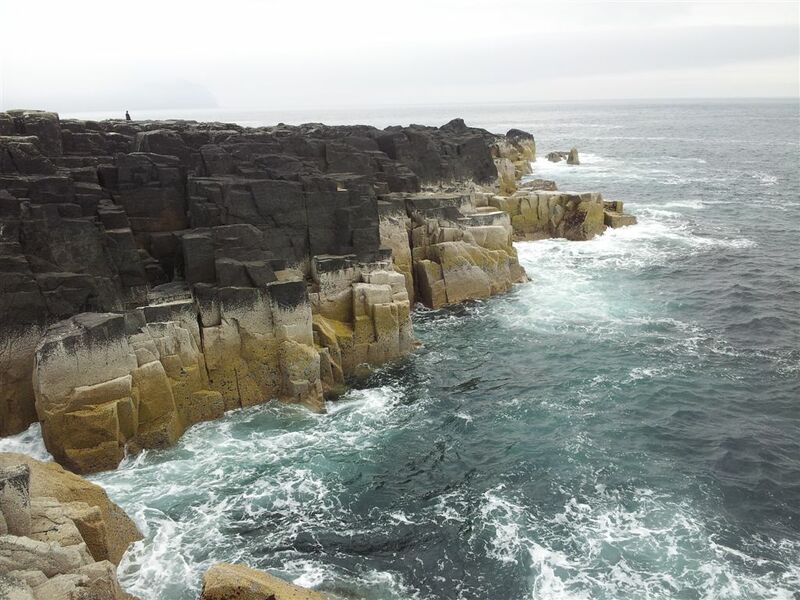 On the way back we nipped up the highest bit for the best views, Alan also spotting a whale down below which of course turned out to be a patch of tidal rock. Then on to the Stein Inn for a much needed pint. Actually all pints are much needed but especially the first one after being outdoors. The Stein was in midge heaven (if you are into midges) and they had a nifty trick for keeping the little buggers out of the pub – they just leave the doors open! 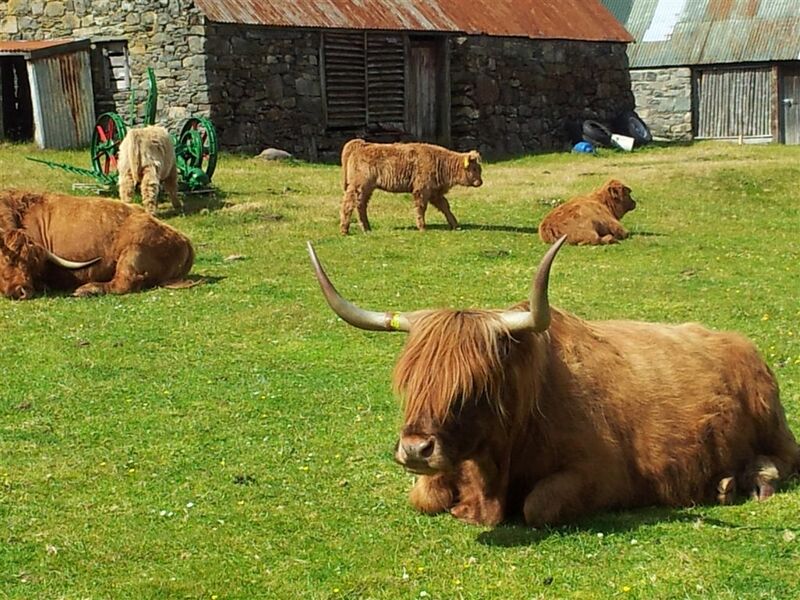 The locals must be immune but the tourists kept slapping their heads & swatting anything that moved. Pub was heaving, glad we had booked earlier, food was standard pub grub, beer nice. 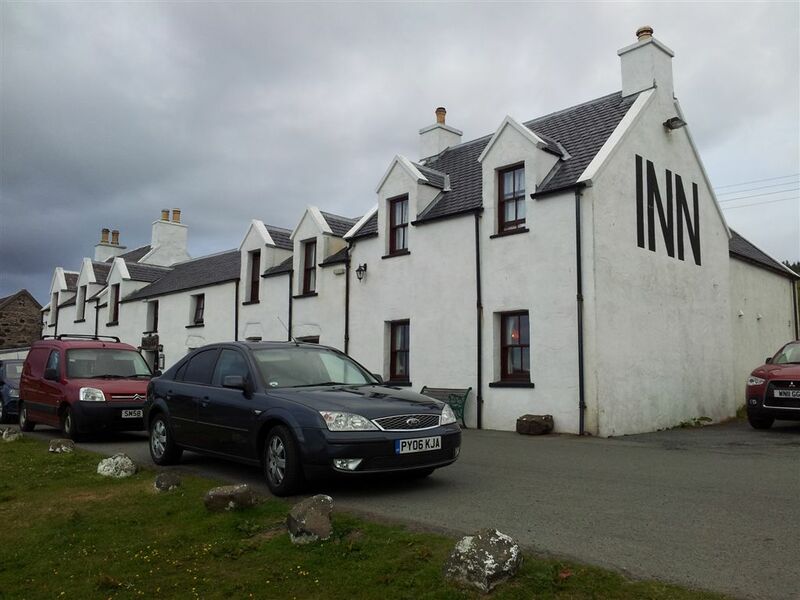 Like the Glenelg Inn the day before the Stein Inn is another rare gem of a proper pubby Highland pub. And so ended another great day, we drove back across Skye through grim weather happy. But what about tomorrow? PS: Niest Point walk details here on Walk Highlands. 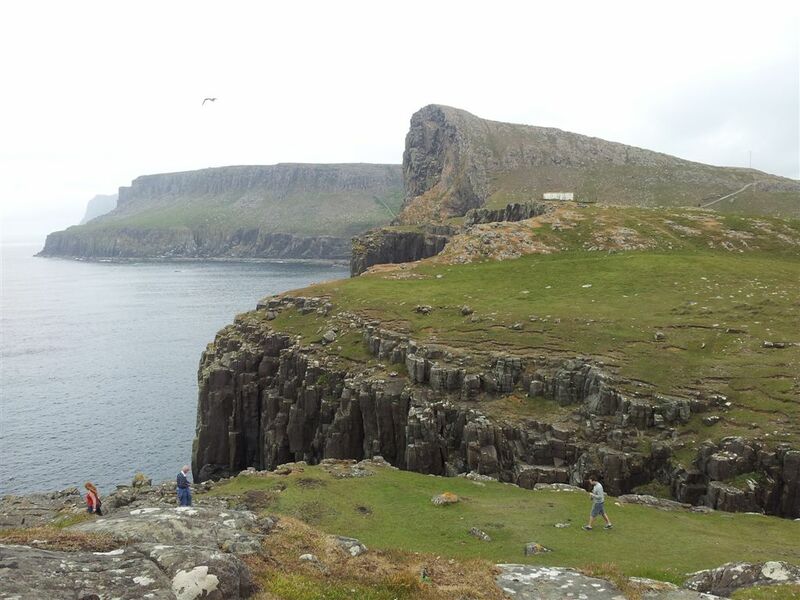 PPS: Random info, scenes for the movie 47 Ronin with Keanu Reeves were filmed on the headland at Neist in Oct 2012. 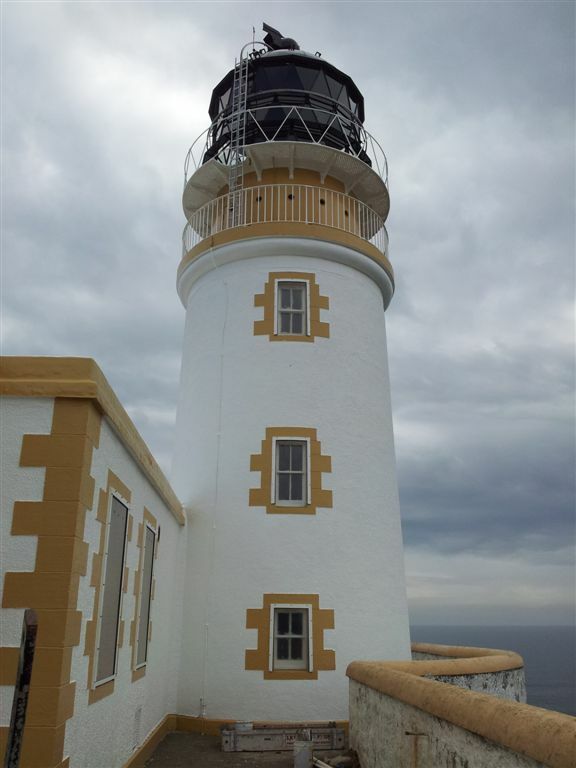 This entry was posted in Scottish Highlands & Skye and tagged Eagle, Highland Cows, Highland mist, Neist Point, Skye, Sligachan, Stein Inn, Waterstein Head, Waterstein Head walk. Bookmark the permalink. 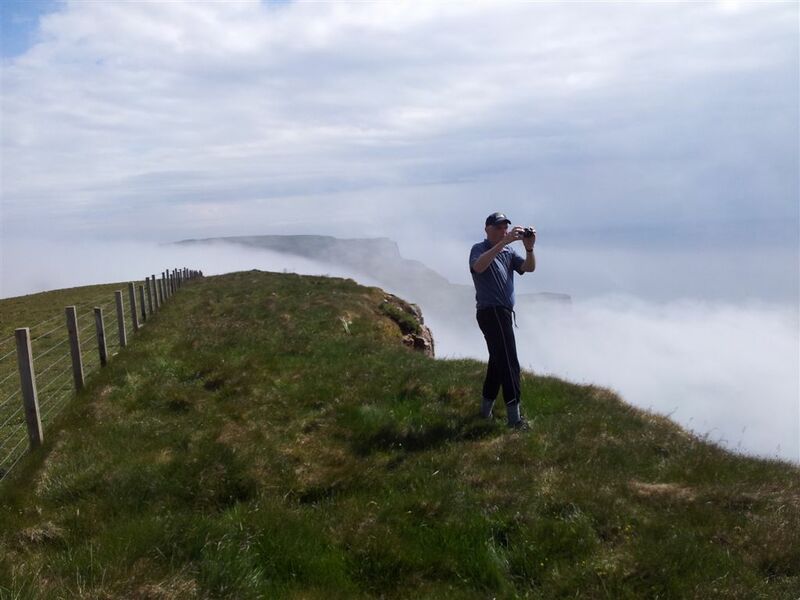 Great photos – did you take those with your phone – such wonderful light even with the mist. Thanks and yes all with the Galaxy S2. I did take a few with my digital camera but they didn’t come out as well, the phone ones were more accurate plus the phone is a wider angle. That eagle was pinsharp Martin. 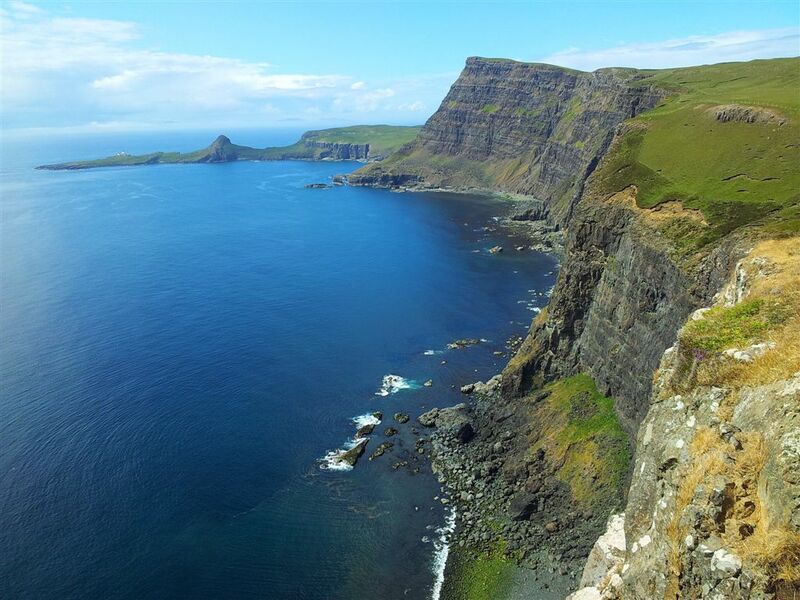 I need to get onto Skye one day, only visited 15yr ago. makes me want to return. Not the easiest thing to try and photo Ray. 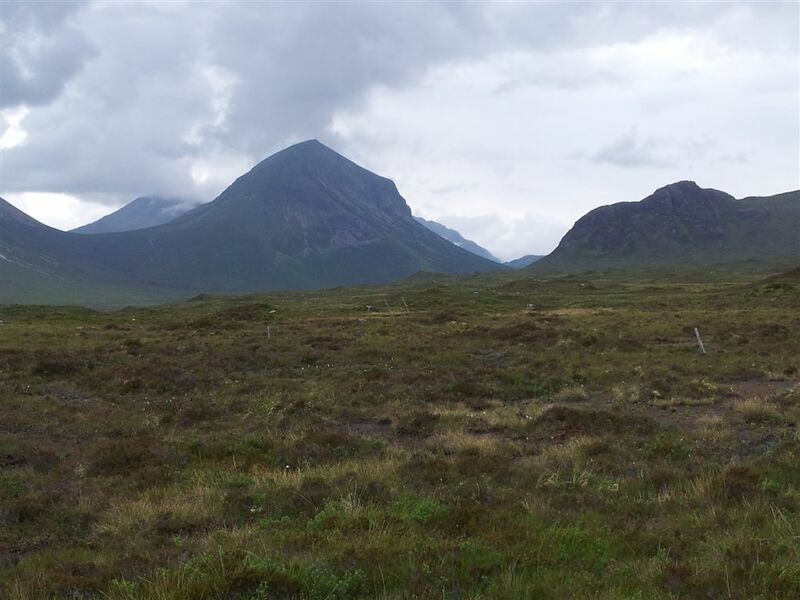 As for Skye it’s a special place for so many reasons, an atmosphere all of it’s own and the Cuillin Ridge is Alpine. Coasts aren’t bad too 🙂 Will read your new blog post later, it will certainly become quicker once you get into it. Mark my words – that pose of yours will soon become known as “The Mart”. And I hope you’ve copyrighted those eagle pics – don’t want anybody pinching them and pretending they took them. A great post Mart. I laughed out loud after that great build up to the eagle shots and then seeing your actual pix. 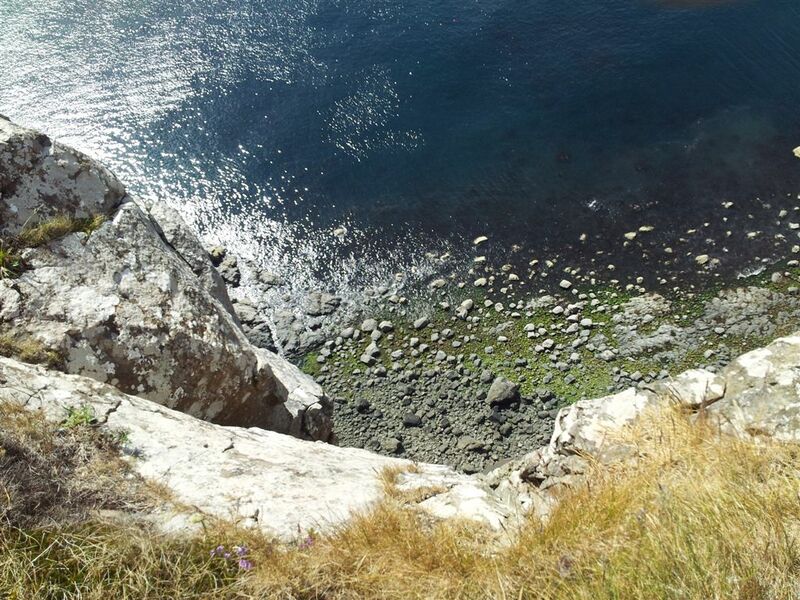 Exquisite clifftop shots – you can’t beat being by the sea. Thanks Chloe, yeah thought I’d got a decent eagle pic till I checked after, you’ll just have to take my word for it 🙂 New blog up now, a bit different! !